You'll be £25.00 closer to your next £10.00 credit when you purchase In the Name of Lykourgos. What's this? In the middle of the 3rd century BC Sparta was a shadow of its glorious past. Politically and militarily weakened and with huge inner social problems, she seemed to have followed the fate of most contemporary city- states and fallen on the fringe of the political developments of her time. The 3rd century was a time when the great states and the Hellenistic empires were prominent. But contrary to the other city states, which compromised with the new political forces of their time, Sparta resisted stubbornly and tried to reclaim the hegemony of southern Greece. In this fight, Sparta showed unexpected vigor, even defying one of the most formidable powers of the time: Macedonia. The uneven collision that followed culminated tragically and painfully for Sparta at the Battle of Sellasia in 222 BC. And still Sparta refused to compromise. After a while, she managed to recover and became once more a player on the international stage, not hesitating this time to challenge the most powerful state of the ancient world: Rome. This last Spartan twilight, the revolutionary movement that sparked it and the two ultimate turning points of her history [the Battle of Sellasia and the Siege of Sparta by the Romans] are analysed in this book with exhaustive bibliography and special emphasis on the military aspects of this epic fight. 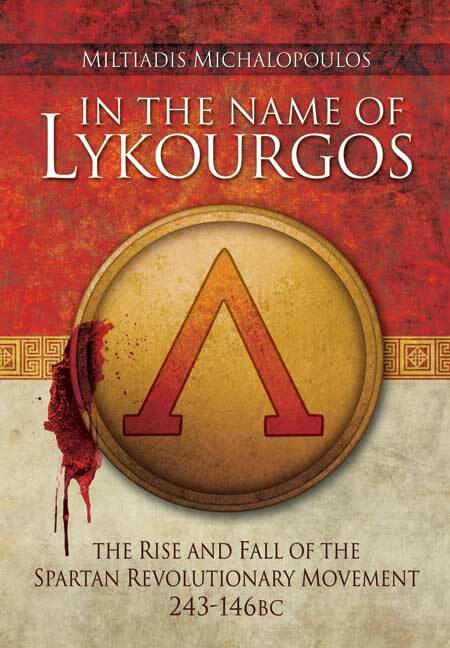 The original Greek edition of In the Name of Lykourgos received great critical acclaim and was named winner of the 2009 Lakedaimonian Prize of the Academy of Athens. It is here translated into English for the first time. In general, the book is well-written, thoughtful, and Michalopoulos successfully brings to life a period in Spartan history that is too often neglected. The greatest achievement of the study is that Michalopoulos convincingly shows that the reigns of Agis, Cleomenes and Nabis should be seen as a wider revolutionary phenomenon and that the mortal agony of one of the most important and influential city states of Ancient Greece was a continuous struggle beginning in the middle of the third century. This is a fascinating look at an often neglected period, tracing the political and military chaos caused by Sparta's last attempts to regain her lost glories. Sparta's last battlefield triumphs and defeats are seen alongside the political events within the city itself, which were often equally as violent, and we follow the story to the end of Spartan independence and her transformation into something close to a Spartan theme park within the Roman Empire. With In the Name of Lykourgos, Militiadis Michalopoulos gives us a fascinating political-military history of a unique period in the history of Ancient Greece… Michalopoulos has done a fine job in explaining a very complex series of political and military events, using ancient sources (largely Plutarch and Polybius) that do not always agree. He deals effectively both with the modern historiography on Sparta and the ancient historical sources. To sum up, it’s worth reading if you have an interest in Ancient Greek warfare or politics. This book, awarded the 2008 Lakedaimonian Prize of the Academy of Athens, is political and military history at its best. This is an excellent book to learn not only everything about the Spartan government and way of life in its glory years, but also its tumultuous history as it fades from sight. Miltiadis Michalopoulos was born in 1960 into a family with strong military traditions which originates from Sparta. He graduated from the Polytechnic School of Athens in 1990 with a BSc in civil engineering and currently works in that profession. He has had a life-long interest in history, particularly military history, and is a prominent member of local war gaming circles. His study In the name of Lycurgus is the result of ten years of intensive research into all available sources and repeated visits to the sites of the battles described in the book.